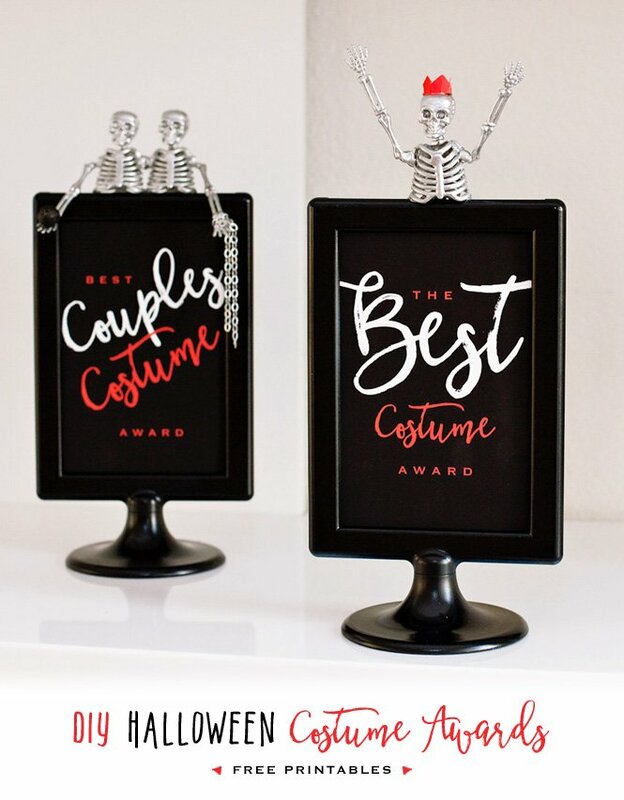 In celebration of Wedding Wednesday AND Halloween, I am so very excited to share this AMAZING Day of the Dead Inspired Wedding with you today! 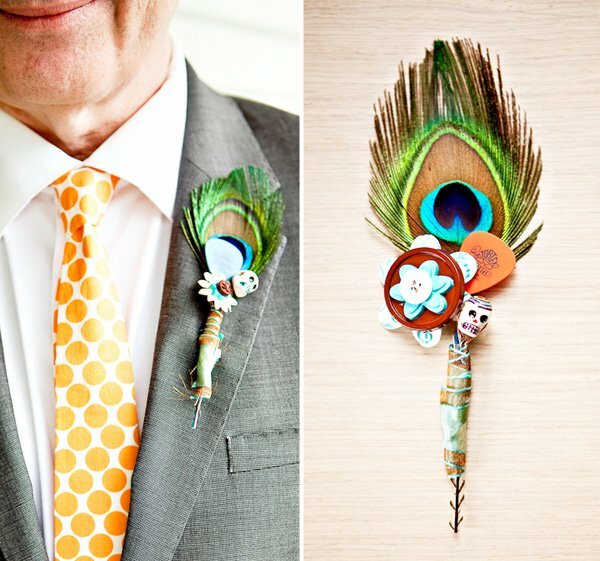 Honestly just working on this post made me so happy this morning… between the cheerful, vibrant color palette and all of the crafty, creative details like button flower bouquets, embellished Orangina bottles, and feather-button-guitar-pick boutonnieres. More impressive yet – everything was designed & styled by the bride herself – Alison – and brought to life with the help of Heiko (the groom) & their friends and family … nice work, everyone! 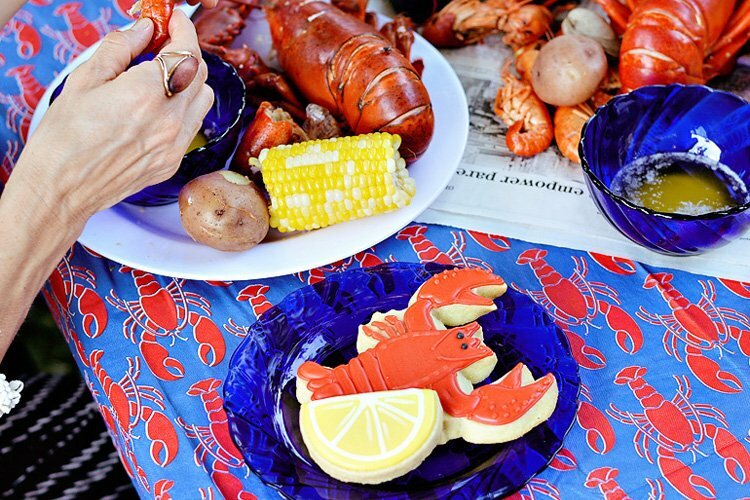 I’ll let the gorgeous images – as captured by the talented Melanie Duerkopp – do the rest of the talking. 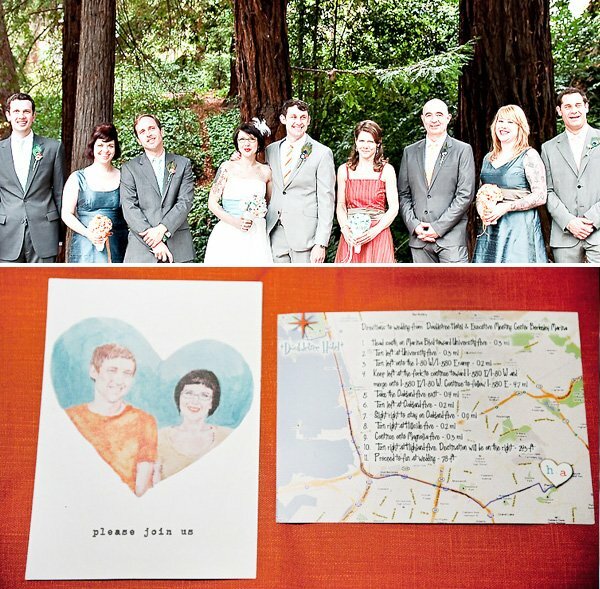 Read on for lots more of them, followed by all the fun creative details from the bride! 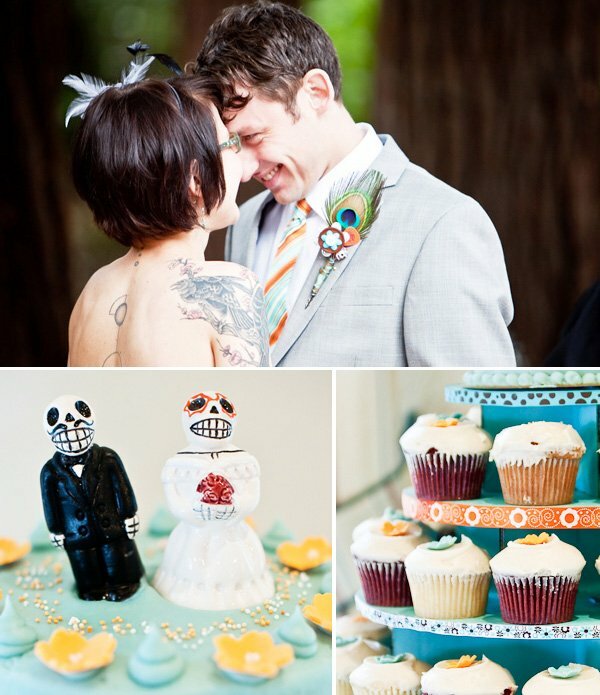 “Our wedding was the day before Halloween, so we decided to go with a Day of the Dead theme. (I am pretty halloween/horror movie/etc. obsessed so it seemed appropriate). 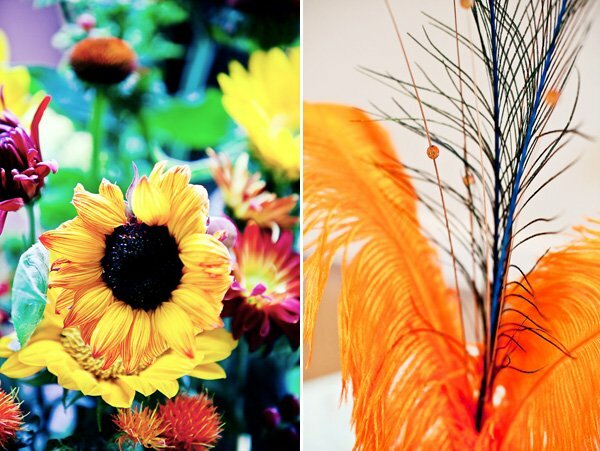 The bridesmaids and I made all the feather centerpieces, feather-button-guitar-pick boutonnieres, and button-flower bouquets ourselves. 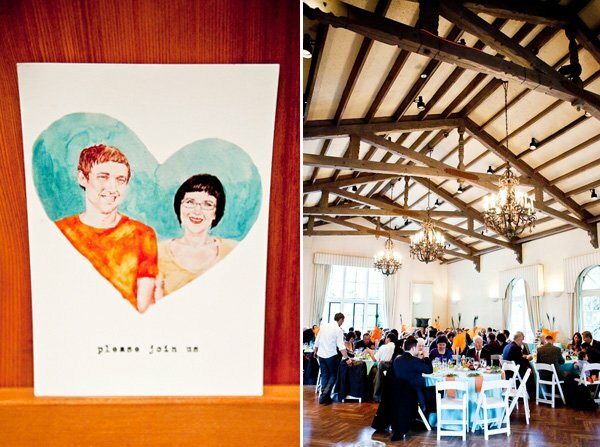 Heiko and I collaborated on the invitations and save the dates–the invite included a watercolor portrait I had done of the two of us and of course his mad computer/design skills. 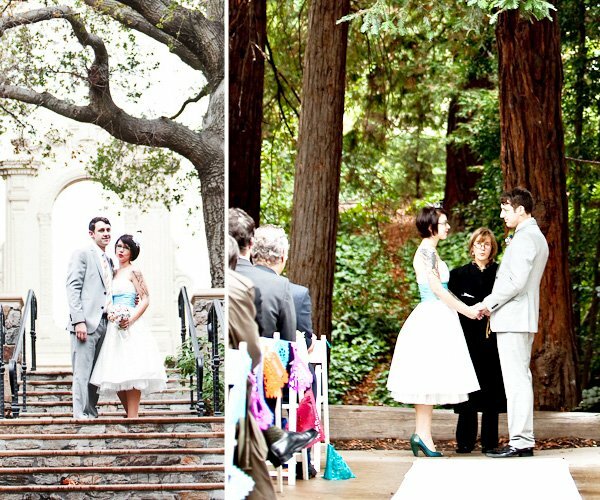 My dress was made by Siri (actually a bridesmaid dress I had made in white), a San Francisco designer. I had a local seamstress add tons of tulle because I couldn’t find a petticoat in exactly the right cream color. The girls wore Lynn Lugo dresses we were lucky enough to find in a sample sale and had altered to add variation. All dresses came through The Wedding Party in Berkeley, CA. We wore Seychelles shoes. I borrowed a pair of earrings from a bridesmaid and wore a handmade headband/fascinator from The Hat Shop in Berkeley. The boys wore H&M suits, except for Heiko, whose suit was Ben Sherman. 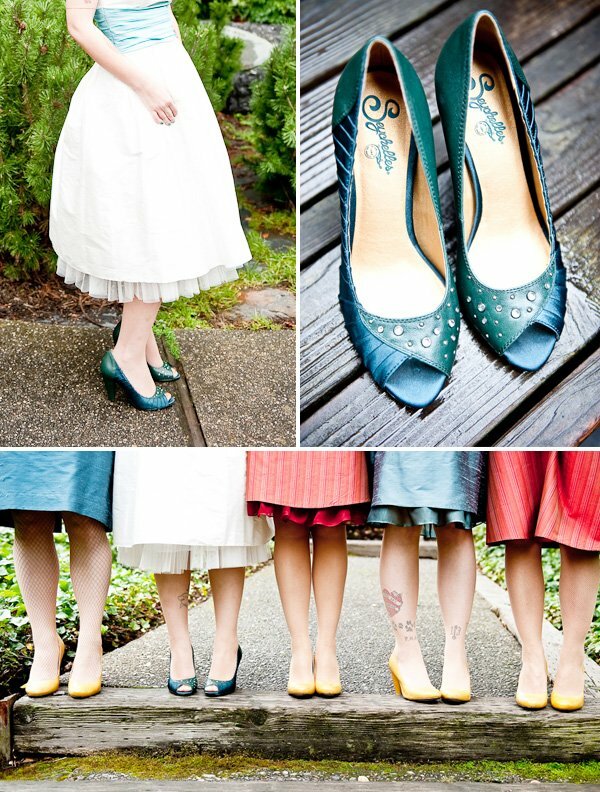 Ties were custom-made by Etsy vendor MeandMatilda. For favors, we gave out two buttons to each guest, which looked so cool pinned to everyone’s suits especially. One was a sugar skull, the other our ‘logo’, a heart with typewritten h and a in it in different colors. 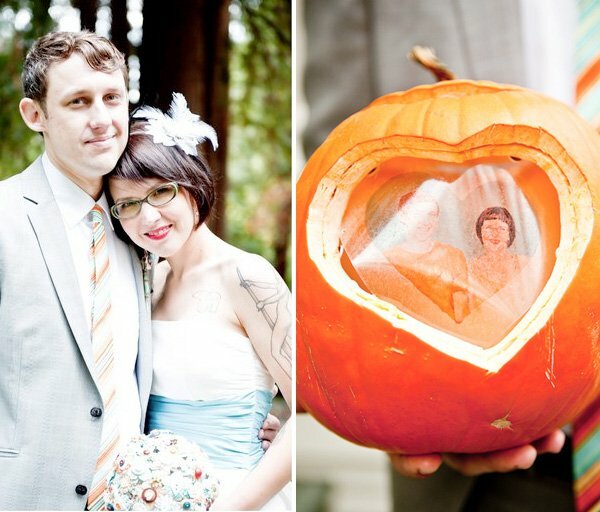 We put them in a glassine envelope with confetti and tied them to Orangina bottles. Heiko and I don’t drink, so we used the Orangina for toasts. My mom, MIL, MIL’s partner, and I worked together to make favors and cupcake tree, which held cupcakes by Love at First Bite in Berkeley, CA. 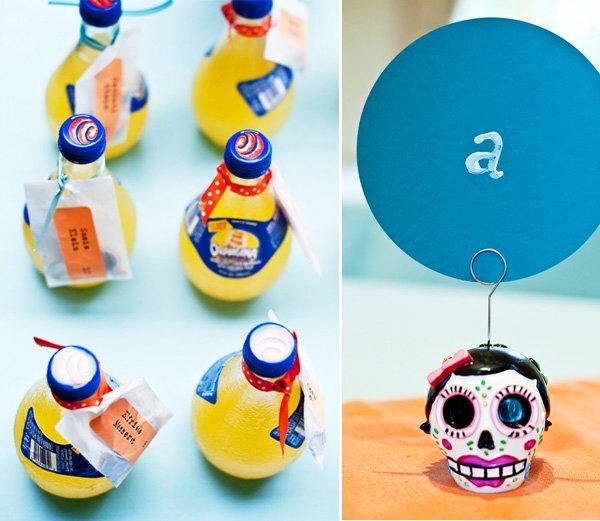 Table numbers were hand painted by me, and held by sugar skull photo holders. 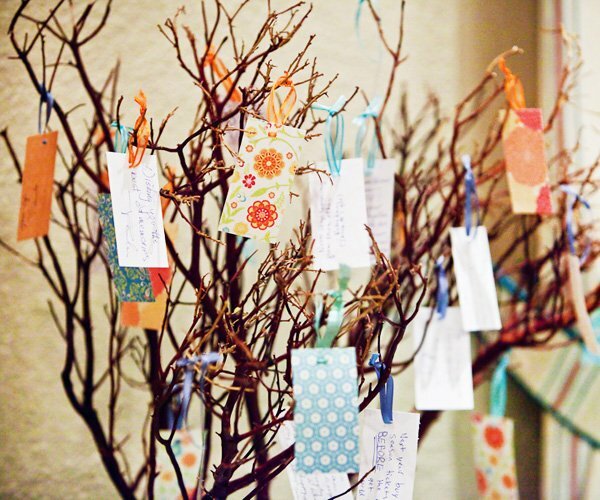 We (me, Heiko and the moms) created a ‘guest book tree’ out of manzanita branches and cut out patterned paper for people to write their messages on. My dad was not able to walk me down the aisle–because he was playing the processional as part of a brass quartet! 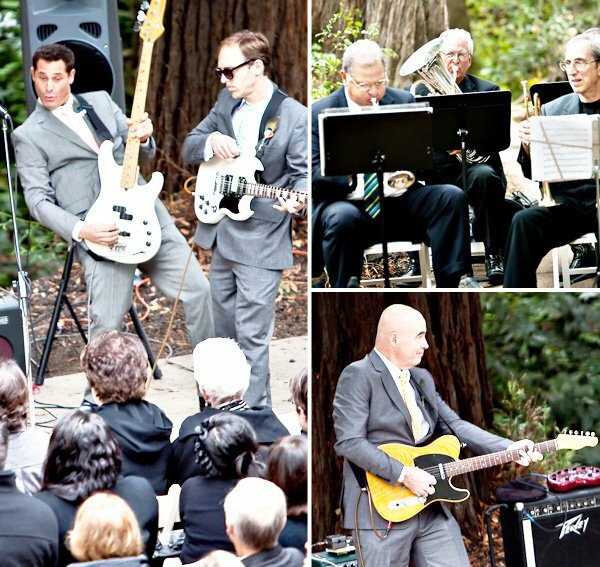 The song played was Phil Philips’ ‘Sea of Love.’ The groomsmen played the same song (singer, electric guitar, and bass) during the recessional. My dad got traditional day of the dead papel picadas to line the aisle at La Borinquena Mexi-catessan in Oakland. Make Up & Hair: I did my makeup and my friend Tiffeny did my hair. WOW! Too fabulous! 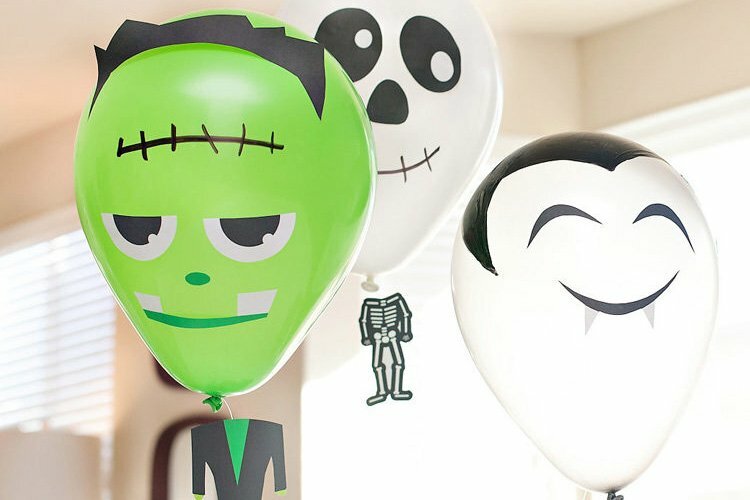 I love how they embraced the Halloween season but didn’t use much black — it still felt romantic and festive without being gothic. LOVE!! So cool! 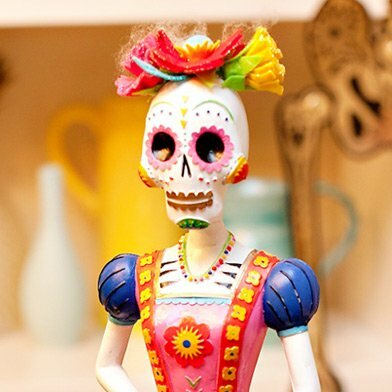 It’s not my shop, but La Santa Muerte on etsy has AWESOME day of the dead wedding decor. Even though I am already married, I am totally digging the embroidered jetaime wall hanging! I love how they brightened up this awesome theme with the color scheme. 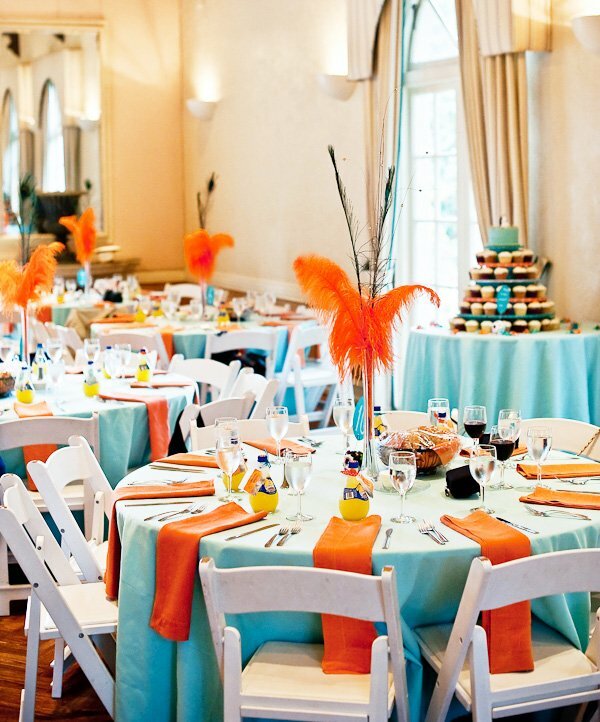 The blue and orange work wonders in creating the celebration aspect of the day of the dead and really makes the theme work for this wedding. It’s awesome! This wedding is so unique! I love it! This is so unique and fun!! Everything looks so great! Love all the wonderful colors! 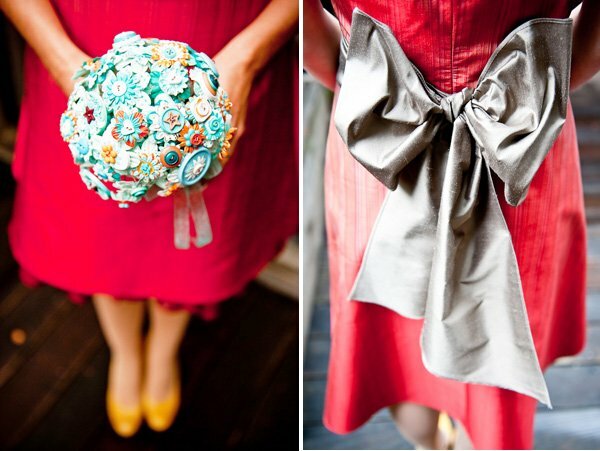 LOVE LOVE LOVE the bouquets. My favorite wedding post so far! Very original. Very beautiful . 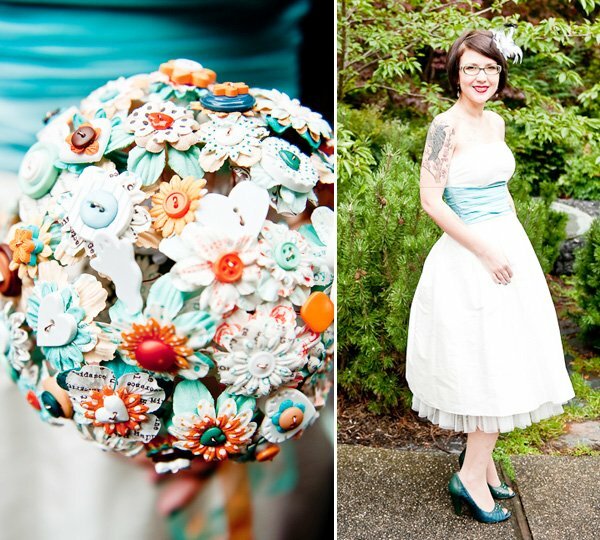 WOOOOOOOOOOOOOW the bridal bunch of flowers made of buttons. The best idea i have ever seen for past weeks. Woooooooow i will do something of my own. Yeeeah. I like non-stereotype weddings!!! 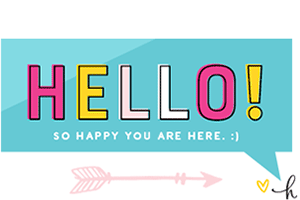 You are cool! 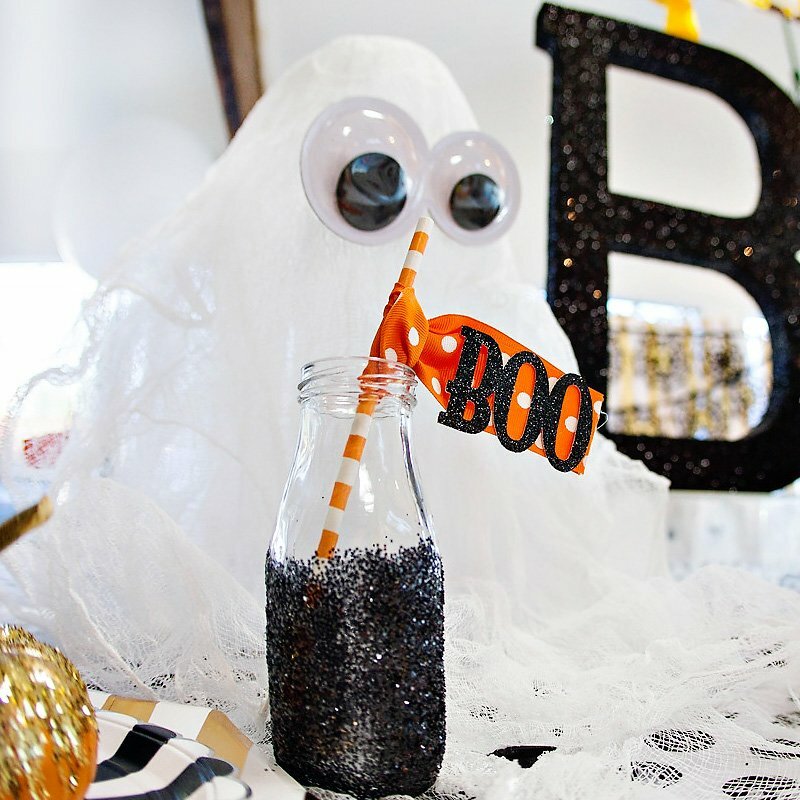 Here are some more great Halloween ideas! I love the colors! 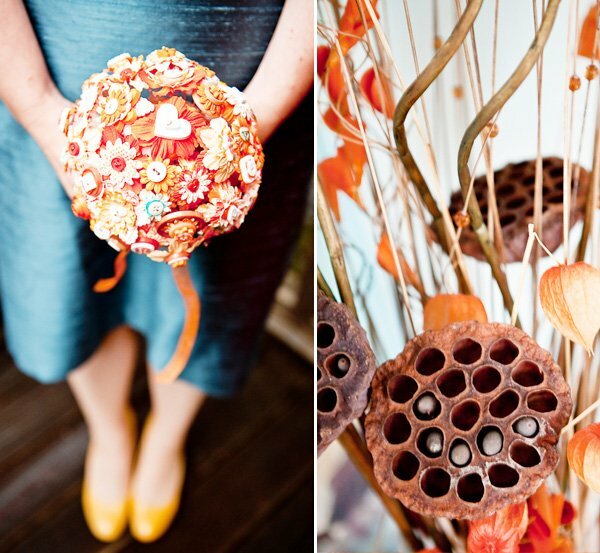 Very original bouquet! 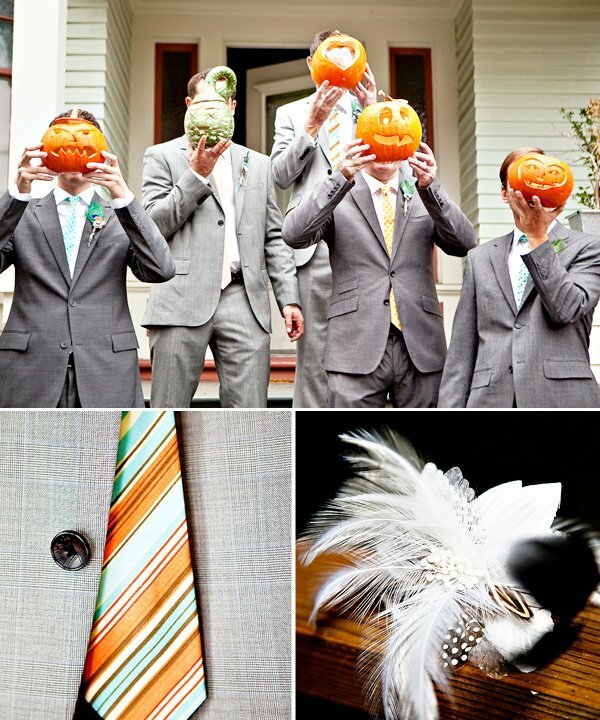 I just love LOVE love this wedding theme you have here! everythingis beautiful, colorful, and unique! I love this wedding. 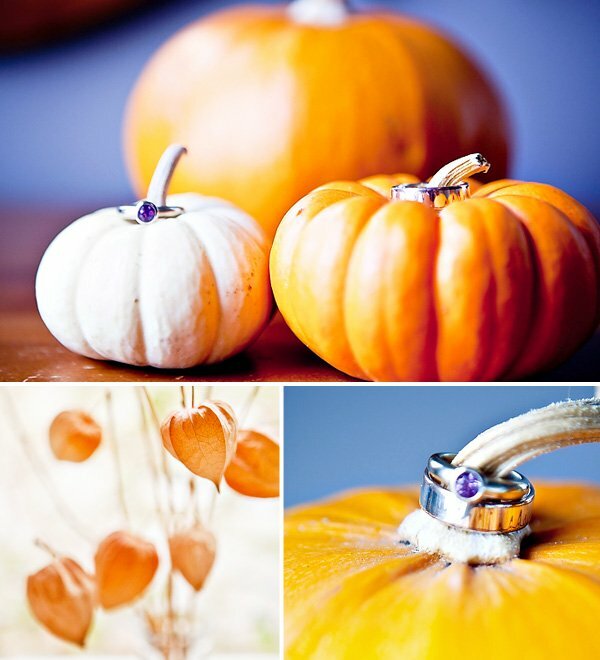 My Fiancee and I are planning a day of the dead wedding and would love to know more about what you used for the bouquets. 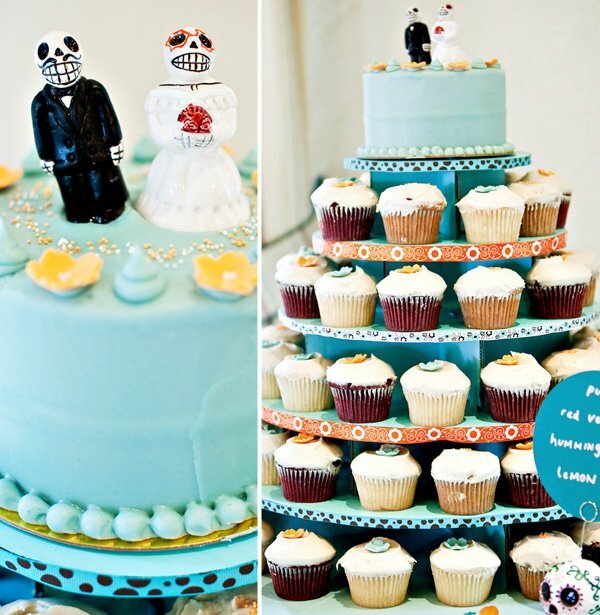 As well as where you found the little sugar skulls on the boutineers.